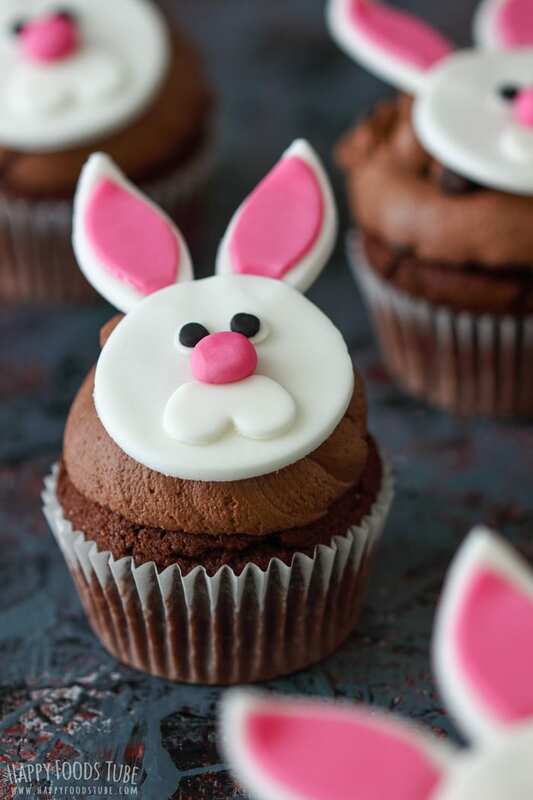 Surprise your kids with these Easter bunny cupcakes! Rich double chocolate cupcakes, frosted with cream cheese chocolate frosting and topped with DIY Easter bunny cupcake toppers! Aren’t these Easter bunny cupcakes cute? They are fun to make and in case you are wondering, there are no special tools needed to make them. 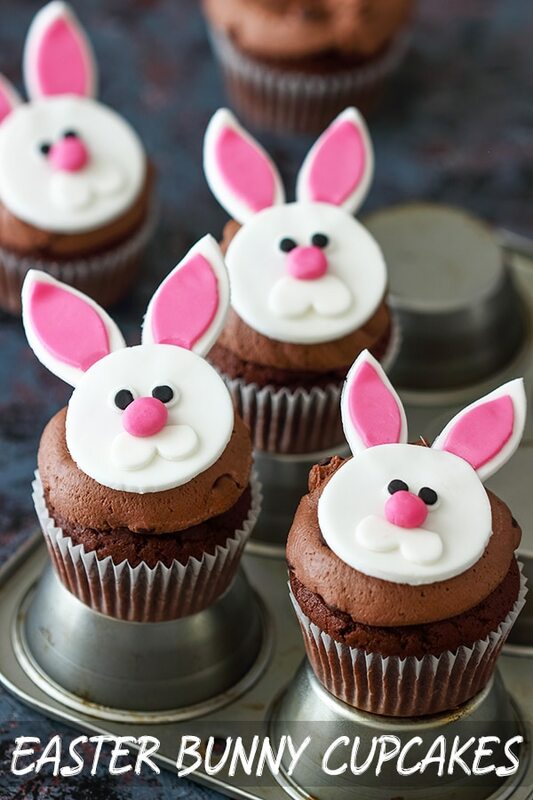 Apart from the fact that these Easter bunny cupcakes are cute, they also are individual sweet treats. And I love making individual desserts! They always look pretty and fancy even though you use simple ingredients. 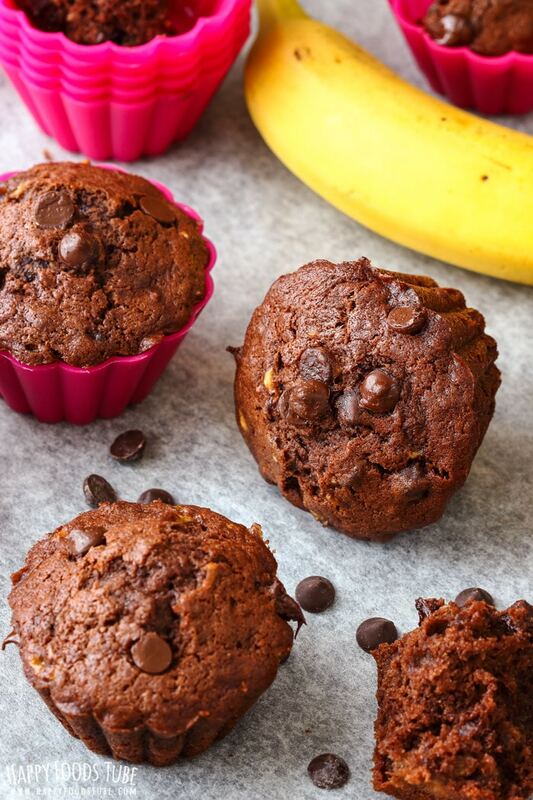 If you prefer using a different cupcake recipe, go ahead and do so. However, these double chocolate cupcakes with creamy double chocolate frosting are worth giving a go! Easter bunny cupcake toppers make pretty Easter cupcake decorations. To make them you will need circle cookie cutters, small heart cutter, a thin straw, a knife and some powdered sugar for dusting your work top. Roll out white fondant. Cut out 6 large circles, 12 small circles and 12 tiny hearts. Using a knife, make a horizontal cut about 2/3 from heart’s tip. You will only need the rounded parts of the hearts to make these Easter bunny cupcakes toppers. Use the large circle cutter to cut the bunny ears. You can get 2-3 ears out of one circle. Check the photos for better understanding. Roll out the pink fondant – make sure you roll this very thin. Cut out 6 circles using the small cutter. To cut out the pink ears follow the same instructions from Step 1. Now roll the rest of the fondant into small balls – these will be the noses. Roll black fondant out thin. Use a thin straw to cut out the eyes. Now it’s time to assemble the pieces together. It’s really easy and if you check the photo I made you will have no problem whatsoever. To “glue” the pieces dissolve some powdered sugar in water. You only need about a teaspoon of water. Use your finger to apply the sugar water to each part. 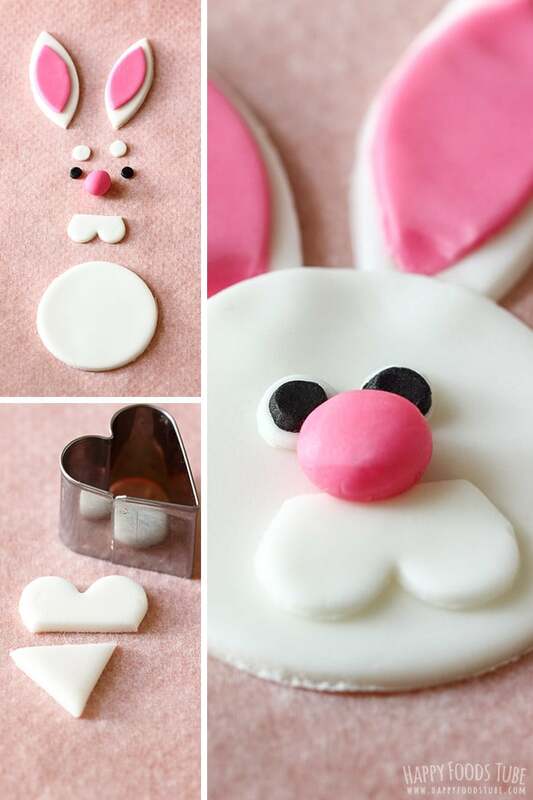 Make sure to leave these Easter bunny cupcakes toppers dry out completely. I recommend to get a tray or chopping board (that you won’t be needing in the following few days). Place a sheet of baking parchment over (you can secure this with a tape, if needed) and assemble each topper right onto the tray. This way you will minimize moving the toppers = you minimize the chance of braking them. 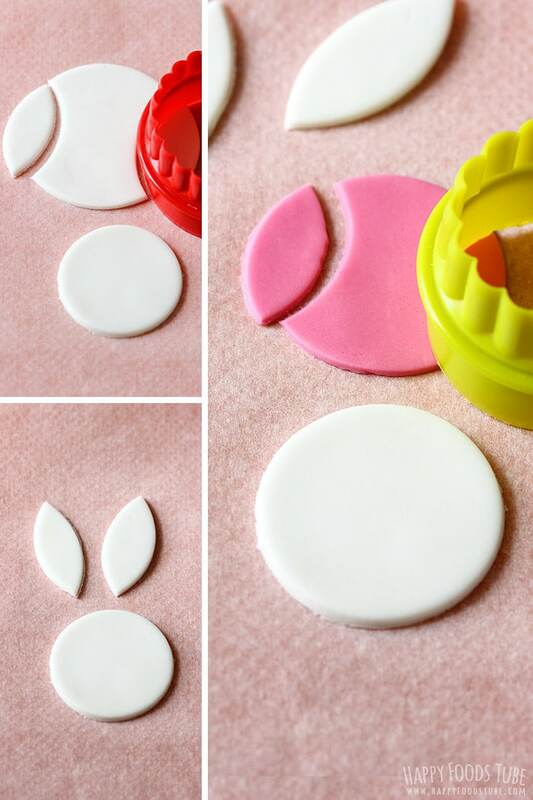 Let these Easter bunny cupcake toppers dry out completely. The time may vary depending on how humid your home is. In general, count with at least 48 hours. When you don’t have time for drying these cupcake toppers, simply place the bunny face on top of the frosting and stick the ears into the frosting. Black edible marker can also be used to pain the eyes. If you don’t have a straw to cut out the eyes, simply take a tiny piece of black fondant and roll it into a ball. Place onto a dusted surface and using your finger, press it down. 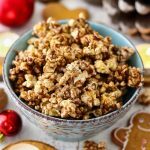 In a mixing bowl, beat the butter with sugar using an electric mixer. 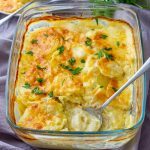 Add the eggs, one at a time and beat well after each addition. Sift in the flour, cocoa powder and baking powder. Stir with a spatula first, then add milk and use the mixer to get a smooth batter. Pipe or spoon the batter into cupcake cases (When piping, fill the cases only up to 1/2. When spooning, fill up to 2/3 of the cases). 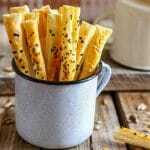 Bake in a preheated oven for 20 minutes or until an inserted skewer comes out clean. 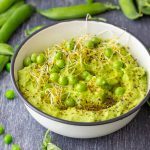 In a large bowl, mix all the ingredients until you get a smooth batter. This should only take a few seconds. Keep it covered in the fridge until ready to frost. These toppers need to be prepared ahead because they need at least 48 hours for setting. Roll out white fondant. Cut out 6 large circles, 12 small circles and 12 tiny hearts. With a knife, make a horizontal cut about 2/3 from the heart’s tip. Only the top parts of the hearts are needed. With the large circle cutter cut the bunny ears. You can get 2-3 ears out of one circle. 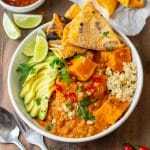 Check the photos, if you need some help. Roll out thin the pink fondant. Cut out 6 circles using the small cutter. Again, use the same cutter to cut out the pink inside of bunny’s ears. The instructions are the same as in the previous step. Roll the rest of the pink fondant into small balls. You will need 12 balls for 12 noses. Roll the black fondant out thin. Use a thin straw to cut out the eyes. To assemble the pieces together mix a teaspoon of water with about a ¼ teaspoon of powdered sugar. This will act as glue. Make sure to place the heads – the small white circles onto a tray lined with baking parchment before you start assembling. Assembling: Glue the pink ear parts to the white ones. Tuck the ears under head and if you are happy with the way it looks, apply some glue on the ear part that will go under and tuck them again under the head. Press down slightly to make sure the ears are attached to the head. Apply some glue to the rest of the pieces and attach them to the head. Repeat with the rest of the toppers. Chocolate chips can be omitted from the frosting. 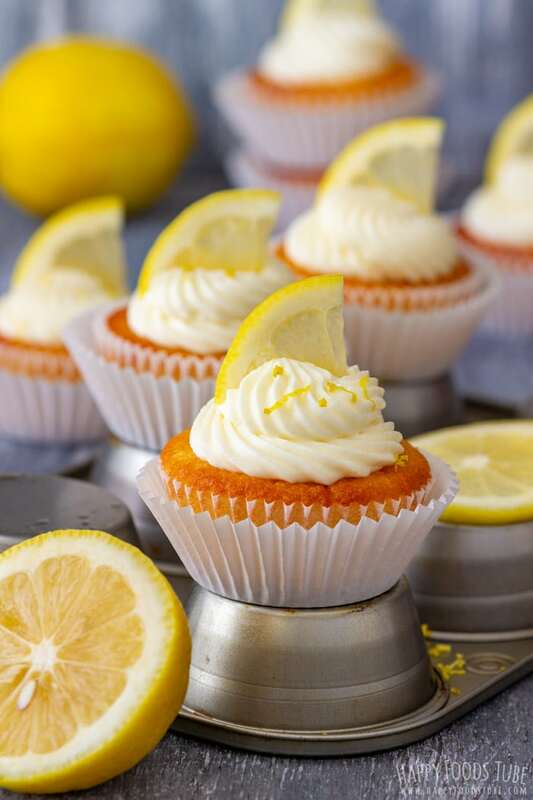 You will get 10-12 cupcakes out of this recipe, depending on the size of your cupcake paper cups as well as the amount of batter you filled them with. Small cookie cutter = use either a 1.5 inch or 2 inch wide cutter(4.5 cm). Large cookie cutter = 2.5 inch (6.5 cm). 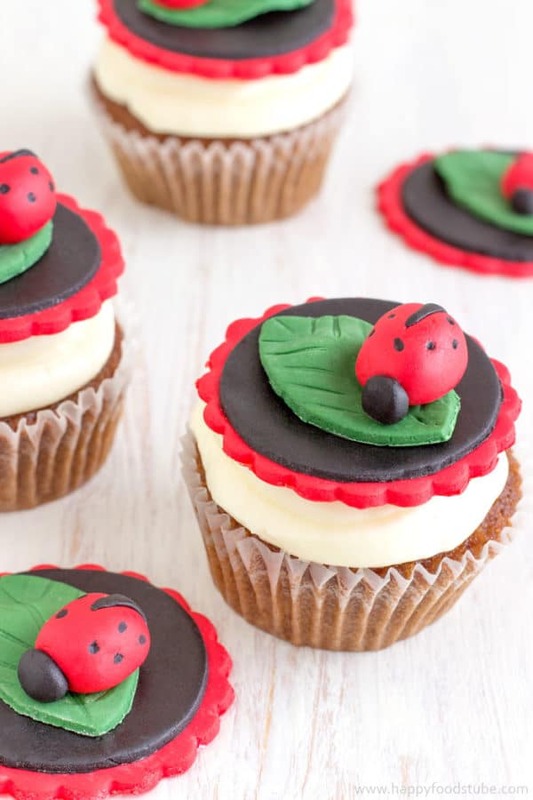 The preparation time does not include time needed to make the fondant cupcake toppers. Count with extra 30-40 minutes + extra time for drying/setting. these are absolutely adorable and fun!! They are perfect for a project to do with kids. I have never worked with fondant before, but these cute cupcakes are inspiring me to give it a try! Oh my, these cupcakes are simply adorable! So cute and just perfect for Easter! Oh my goodness, these are SO stinking cute!! 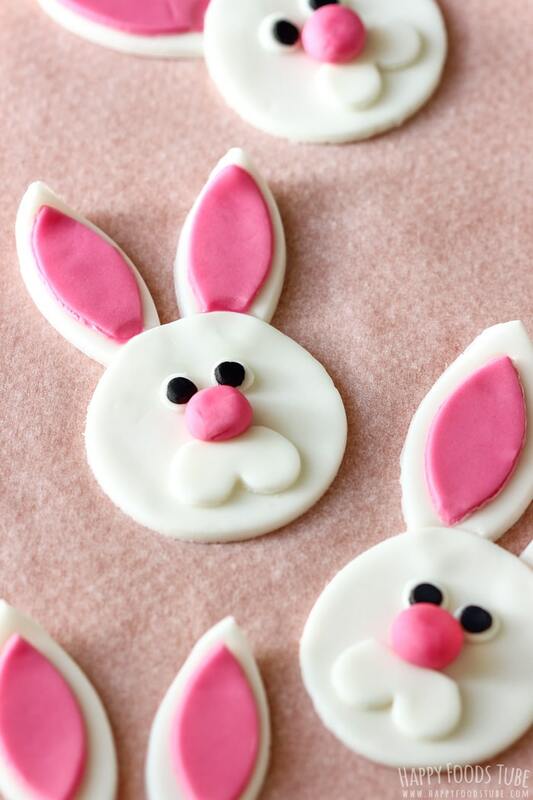 Love the homemade fondant bunnies, they look amazing! 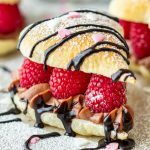 I don’t have kids, but I would love to make these or receive them for Easter!